Fashion Week in New York has come to a close and the beauty was remarkable. A designer we always look forward to seeing – especially after his departure from Louis Vuitton – Marc Jacobs. 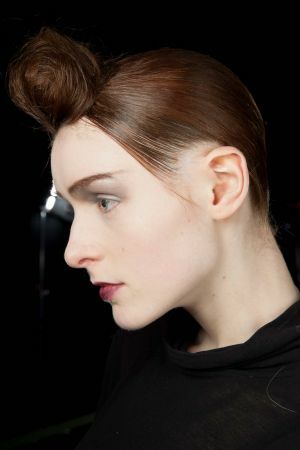 Since his descent from the large power house – his collections are getting more incredible and with his beauty line expanding – it makes sense that on the runway the hair and makeup would add a large presence to the collection. The top-knot is always going through different phases of referral. One minute we are channeling ballerina buns and the next it is messy bed hair tied with minimal effort. 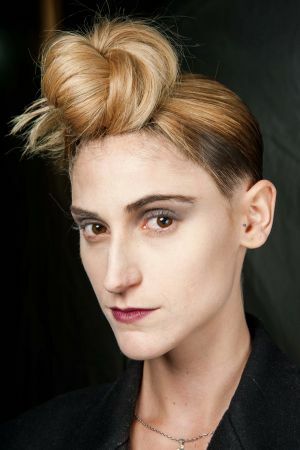 For Fall 2015 Marc Jacobs saw the top-knot in a forward fashion – sitting in the frontal lobe and tied in almost a boat knot like fashion with the ends falling out slightly. Usually when tying a top-knot a lot of emphasis goes into deciding which part of the head the bun should sit on – if all else fails, make like MJ for an updated version and expect dreamy flyways.